Yes it’s true, Sorting Thoughts 2.0 is finally here and it comes with a bunch of new features. Sorry for the long wait, but things never turn out the way you expect and sometimes things come back. I hope you enjoy the new big update. The new design is lighter and more focused to the content. Now the iOS and desktop version have a common design concept which makes the work of both sides much easier. 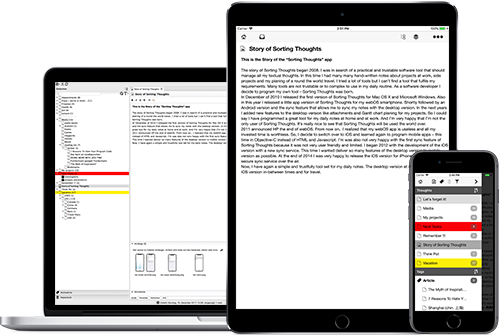 Like the iOS version you will have now one thought library which saved all your collections. The switching between collections is much faster and it is much easier to create a new collection. All saved changes of a thought will be automatically stored in versions. It is possible to track changes and you can see the history of a thought. The new version view allows you to restore a old thought version. With the additional sync service you will be able to sync all your thoughts between the desktop and iOS app in a wireless and secure way with full end-to-end encryption (E2EE). If you already use the sync service with the iOS app you will have no extra costs. Your subscription is also valid for the desktop version – sign-in with your sync account and it will just work. Otherwise, I will offer a one month subscription for US$ 1.99 and a one year subscription for US$ 14.99. Btw, with a sync subscription you can use all features of the ST iOS app. No Java installation problems anymore. The setup files for Windows and macOS comes now with a bundled Java Runtime Environment. The update to version 2.0 is free for all users of version 1.4. After the installation process you must create a new thought library and import your old thought collections. The complete change log is available on the new documentation page. If you have questions or problems with the update, please contact me via the support page.